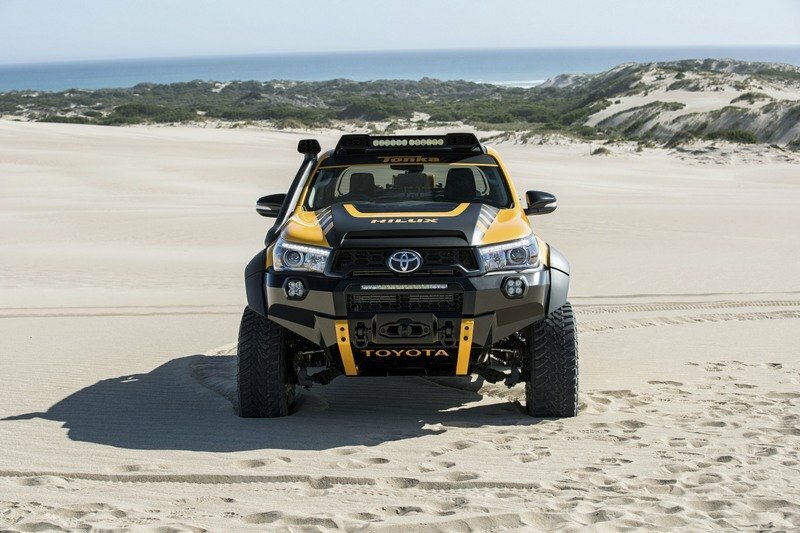 Toyota Australia is commemorating its corporation’s 80th anniversary, along with the 70th anniversary of the famed toy truck builder, Tonka, with this one-off concept HiLux pickup styled with outlandish bodywork and ton of off-roading equipment. 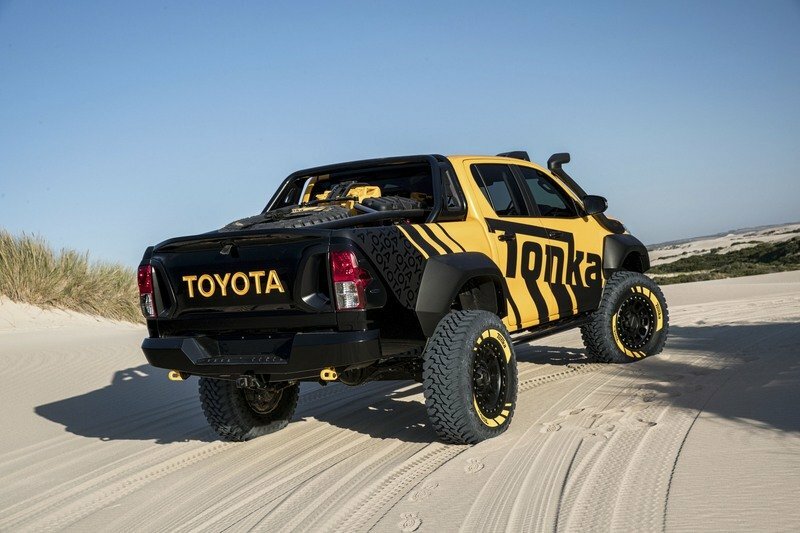 Fittingly called the HiLux Tonka Concept, this truck is designed as the grown-up version of a kid’s favorite toy truck. And it should have no trouble traversing an adult-sized sandbox. The HiLux Tonka features a six-inch lift thanks to a taller suspension and portal hubs. Toyo Open Country MT tires sized at 35 inches give it all the traction it needs, while custom bumpers add protection and the ability for self-recovery. Hidden behind the front bumper is an electric winch, which frame-mounted tow hooks on each side. Of course, what’s a Tonka truck without some awesome black graphics atop a yellow base coat of paint? Toyota didn’t leave Tonka fans wanting in that department. And besides the bumpers, the hood and tailgate are also unique, adding to the appeal. Sadly, neither Toyota nor Tonka have any plans to sell copies of this truck. Rather, it will make its rounds at auto shows, expos, and demonstrations around Australia in the coming months. 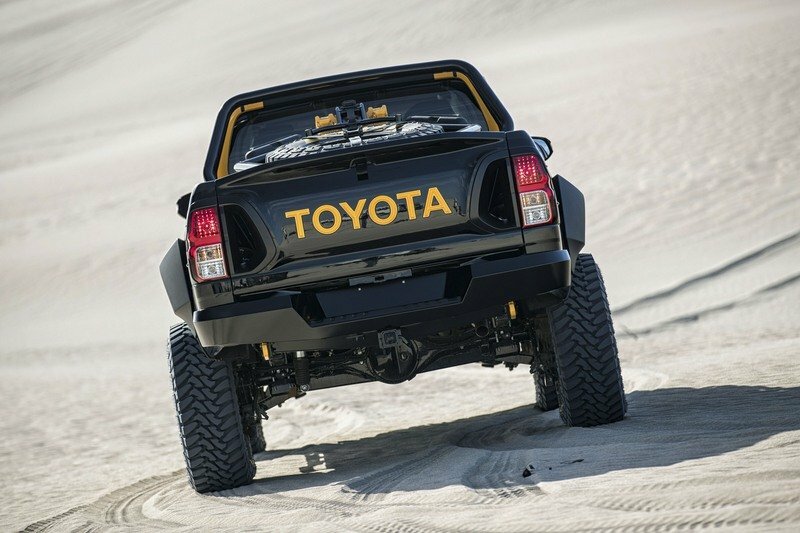 Continue reading to learn more about the Toyota Hilux Tonka Concept. It’s quite easy to see this HiLux has very little untouched real estate on its exterior. Nearly every body panel has been massaged for a bolder, more engaging design. 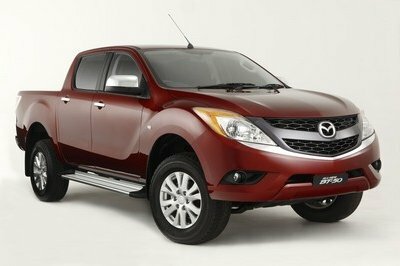 Up front, the bumper is a large steel unit, built to protect the truck against off-road obstacles. Tow hooks, a winch, and LED lights give it more utility. The bumper is also shaped to improve the truck’s approach angle, giving its front tires maximum access for climbing. Thick underbody skid plates protect the engine oil pan and other vital parts. Nearly every body panel has been massaged for a bolder, more engaging design. Up front, the bumper is a large steel unit, built to protect the truck against off-road obstacles. The grille is also unique, getting two nostril-like shapes near the headlights. These shapes are mirrored in the tailgate, as well. The hood features a large scoop and is formed from carbon fiber. 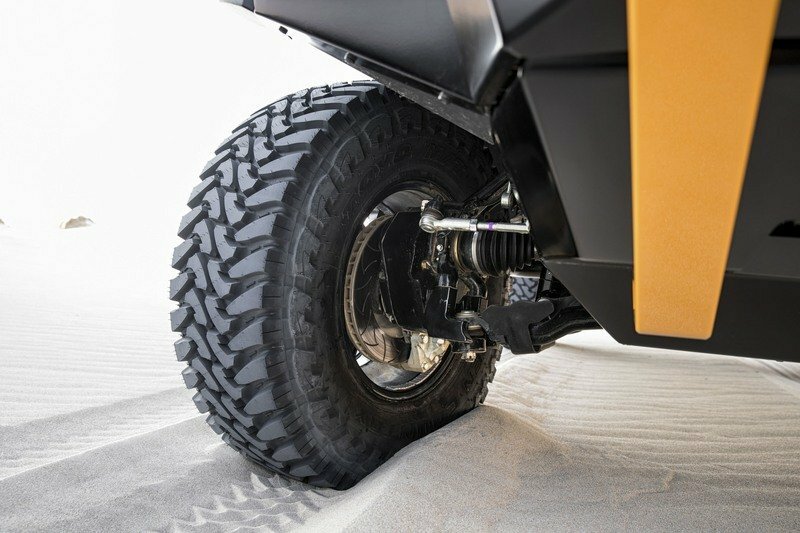 Wide fender flairs keep rocks and mud from hitting the paint, while massive, 35-inch Toyo tires with custom Tonka graphics (just like the toys) churn up the terrain. The tires are wrapping 17-inch Method wheels. Out back, the tailgate has been modified with those nostril-like vents, which Toyota says is for airflow. The tailgate is also made from carbon fiber for decreased weight. More tow hooks and a two-inch receiver hitch reside under the rear bumper for added utility. Speaking of utility, this HiLux is loaded with it. The bed has a custom tube-frame structure that acts as a roll bar, along with a support for the full-size spare. Integrated Jerry cans hold extra diesel, along with space for tools and a fire extinguisher. The engine is fed through a high-mounted snorkel, keeping the intake free from water. The hood is vented for better ventilation of head. The roof features a LED light bar surrounded in a custom enclosure. Last but not least, steel rock sliders that double as cab steps protect the rocker panels from off-road dangers. Note: Standard Toyota Hilux interior pictured here. Toyota didn’t mention any improvements or changes to the cabin, so we’re left with what’s likely a stock interior. The truck is based on the range-topping Double Cab SR5 trim level, meaning it comes with either leather-accented cloth seats or full leather seats. 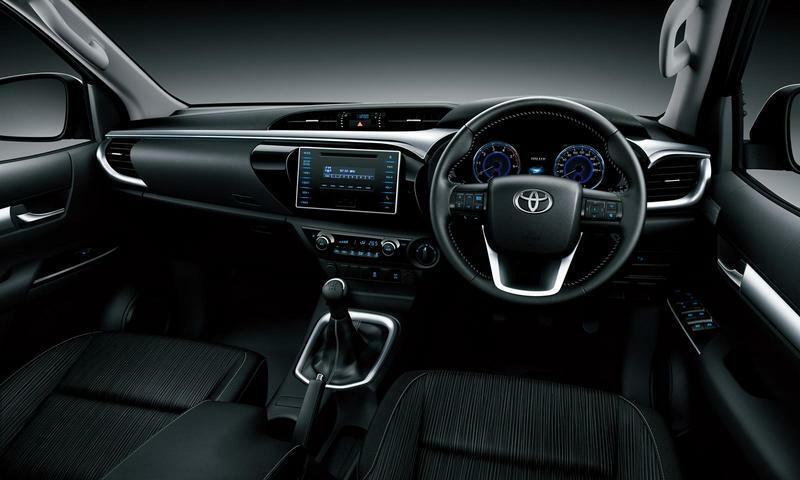 Toyota Entune touchscreen infotainment system is also standard at this level, as is the TFT display in the driver’s gauge cluster. Under-seat storage is found under the upward-folding rear bench, while eight grab handles make getting in and out a bit easier. Under the hood lies Toyota’s 2.8-liter four-cylinder turbodiesel. The engine generates 174 horsepower and 310 pound-feet of torque. The longitudinally mounted engine mates to either a six-speed manual or six-speed automatic transmission. A two-speed, part-time transfer case sends power to the front wheels when necessary, and is operated by the driver. Under the hood lies Toyota’s 2.8-liter four-cylinder turbodiesel. The engine generates 174 horsepower and 310 pound-feet of torque. The truck uses special hubs called Portal hubs to increase the ground clearance. They move the center of the wheels below the centerline of the axle, giving more clearance between the lower control arm and the ground. Performance brakes bring the truck to a stop. The suspension has been upgraded with beefier shock absorbers to handle off-road pounding. The HiLux’s basic suspension design remains unchanged, however. With an independent from suspension with MacPherson struts. A solid axle supports the rear, held in place with leaf springs and opposing-mounted shocks. Though this truck won’t hit showrooms, it does show how far HiLux owners can take their truck wit a little (or rather a lot) of money. The outlandish design is typical for Tonka toys and looks surprisingly good on this mid-size pickup truck. The concept does a bang-up job of celebrating the anniversaries of both Toyota and Tonka while attracting attention. It’s also noteworthy that the HiLux was the best-selling vehicle in Australia for 2016, surpassing sedans and SUVs along the way. There’s not doubt the folks down under love their trucks as much as Americans do, if not a bit more. 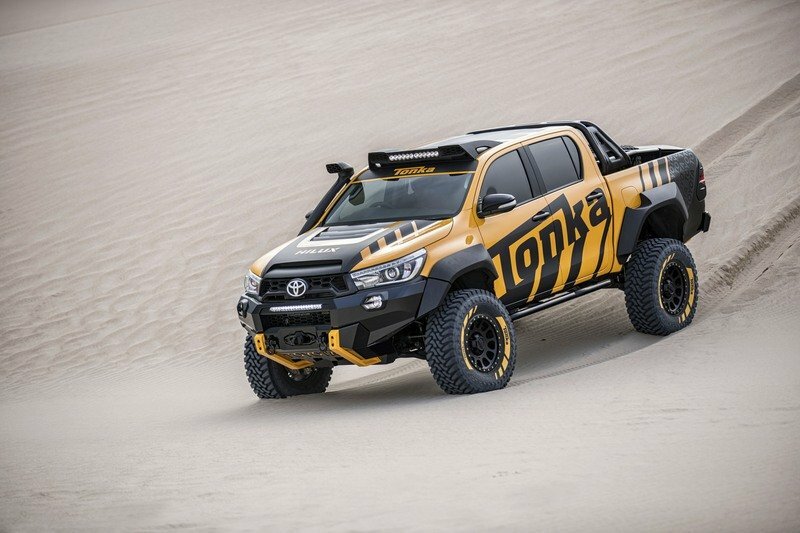 Toyota is rekindling childhood memories with the reveal of a stunning concept vehicle that brings together the iconic Tonka and "unbreakable" HiLux brands. 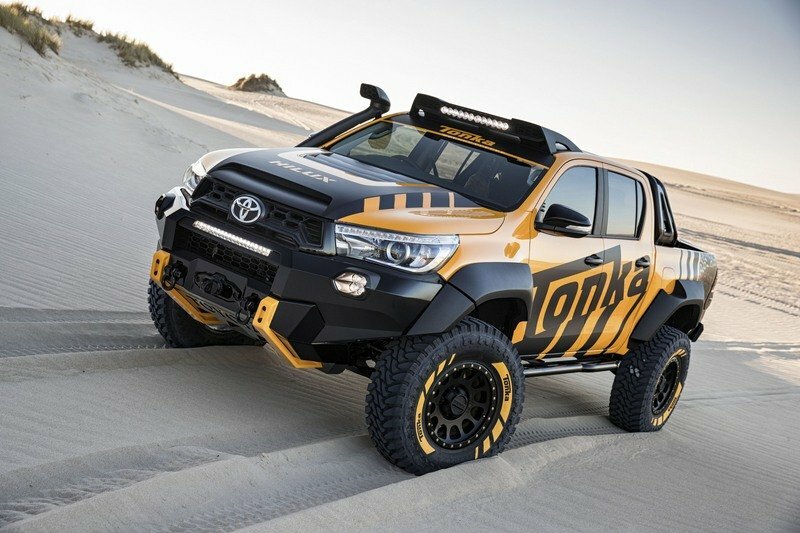 A full-size dream toy for adults, the HiLux Tonka Concept is an impressive rock-crawling truck that combines the enviable reputations for toughness and durability that dominate the Toyota and Tonka DNAs. 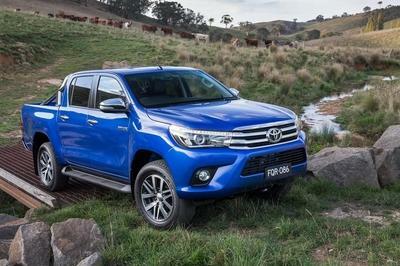 The high-riding off-roader celebrates HiLux’s breakthrough in becoming Australia’s best-selling vehicle last year, alongside significant global anniversaries for both Toyota and Tonka. It was conceived, designed, assembled and tested by designers and engineers from Toyota Australia’s 150-strong product planning and development division. 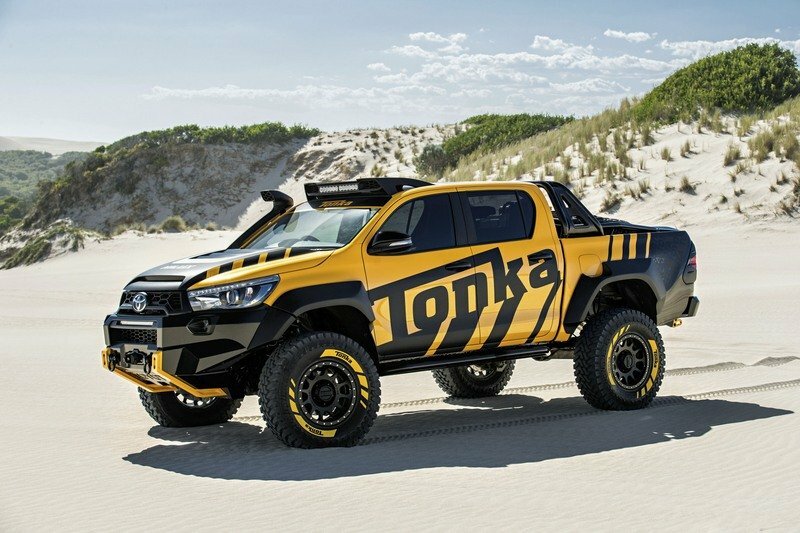 Product design chief Nicolas Hogios said the extreme style and capability of the HiLux Tonka Concept would capture the imagination of kids and adults alike. 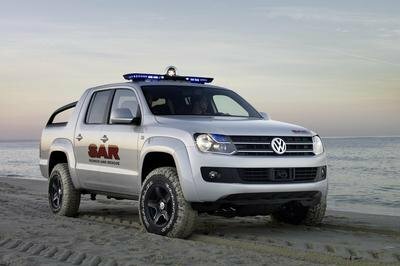 "We have taken Tonka out of the sand pit and reinvented HiLux from top to bottom and from nose to tail," Mr Hogios said. 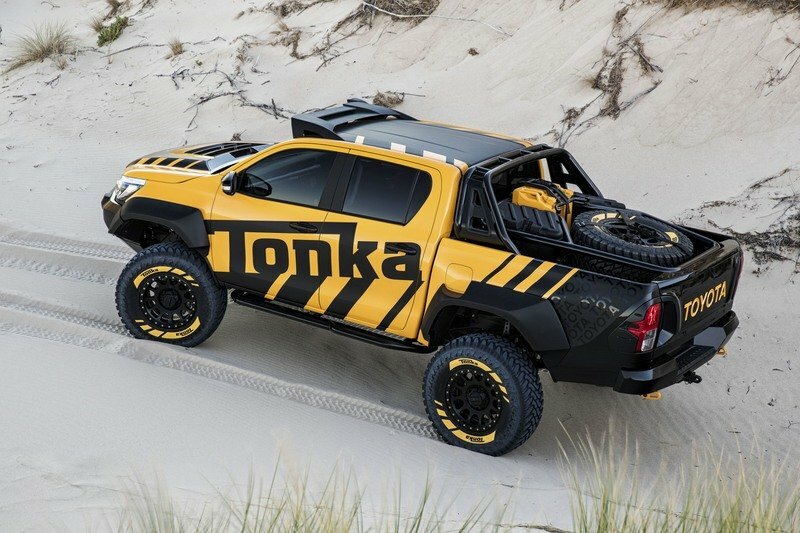 "Inspired by the Tonka trucks that kids play with in their backyards, the HiLux Tonka Concept goes way beyond the already hugely capable abilities of HiLux to traverse rocks and other rugged terrain," he said. 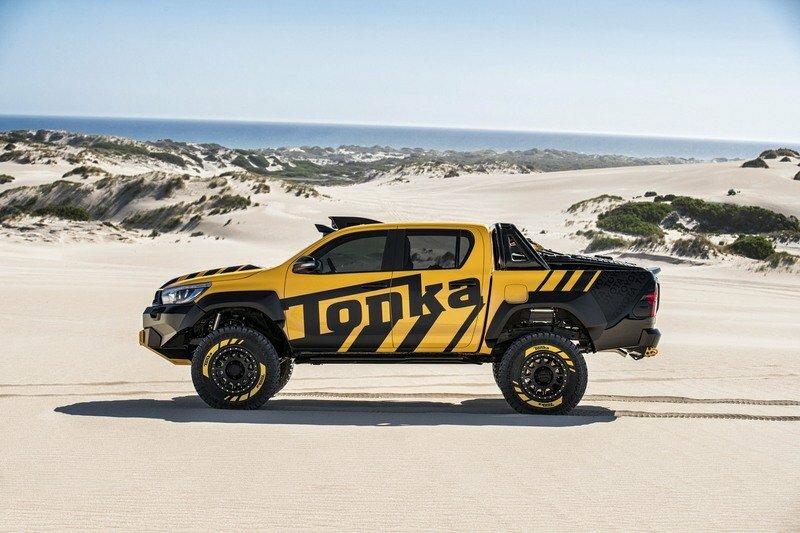 "The HiLux Tonka Concept is dramatic evidence that our local team loves to have fun, we’re keen to explore new ideas and we’re always looking to push the boundaries of what’s possible," he said. 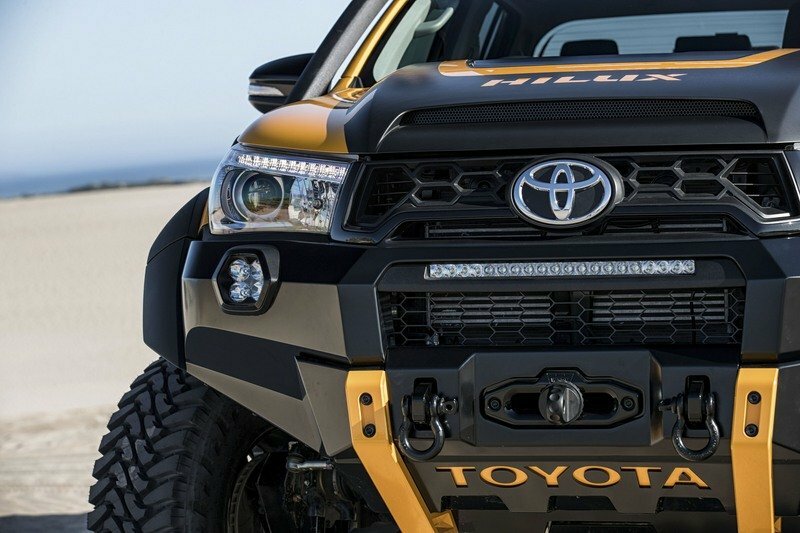 Underneath the dramatic black-and-yellow livery of the HiLux Tonka Concept is the top-of-the-range production HiLux - the SR5 double cab with a powerful 2.8-litre four-cylinder turbo-diesel engine. An extensive makeover starts with substantially extra ground clearance - an increase in ride height of 150mm (6 inches). Combined with a high-riding axle, heavy-duty suspension and 35-inch diameter tyres, the HiLux Tonka Concept is equipped to power over rugged terrain that would be off-limits to other off-roaders. A new front bar is compatible with the vehicle’s safety systems while the bonnet has a carbon-fibre skin and features an aggressive "power bulge" and air scoops. 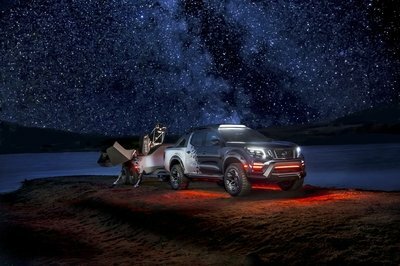 High-performance off-road LED lighting in the bar and roof pod combine to provide excellent night vision for off-road trails. A rugged bash plate made from 6mm-thick alloy is designed to protect the sump and other vital components. Tubular side rails protect the body and chassis. Behind the cabin, almost everything has been changed. The transformation includes a new tailgate, also wrapped in carbon fibre, that incorporates an integrated spoiler and two air vents for optimal airflow. A durable, lightweight strap rather than a handle releases the tailgate. 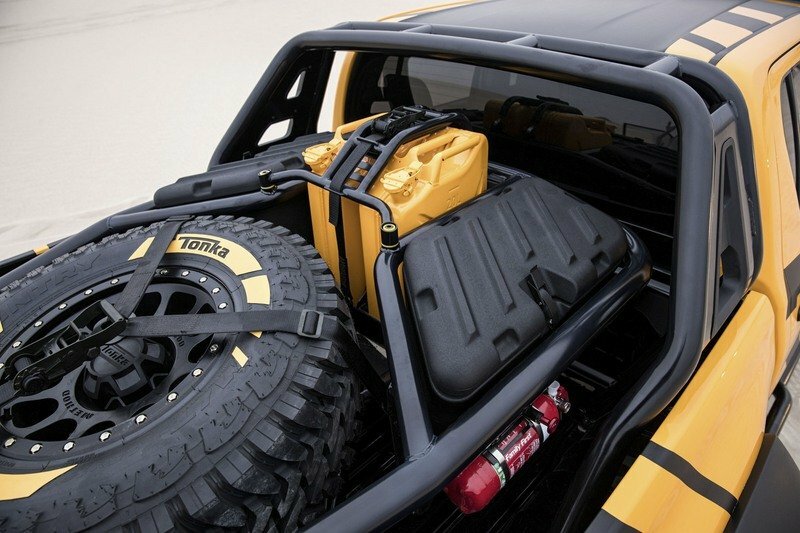 Inside the tub, a removeable tubular frame keeps all the gear in place, including diesel fuel cans, while storage boxes house the recovery gear needed for extreme off-road driving. A fire extinguisher, axe, shovel and high-lift jack are also fitted. Tonka is a household name, celebrating its 70th anniversary this year. Equally renowned, Toyota is in its 80th year of incorporation. Since HiLux was first launched in 1968 it has earned and reinforced its reputation for being "unbreakable" - and for being popular. To the end of February this year, Australians have bought more than 920,000 examples including 530,000 4x4s and 390,000 4x2s. Globally, HiLux sales have topped 16 million. Last year, HiLux became the first vehicle other than a passenger car to be the best-selling vehicle in the country. Toyota Australia’s product design and engineering capabilities have global reach, supporting the development of vehicles manufactured for Australia, the Asia-Pacific region and other markets. While the HiLux Tonka Concept is not destined for dealer showrooms, adults and kids alike will have the opportunity to share the dream as it tours 4WD shows, field days and expos around the country.